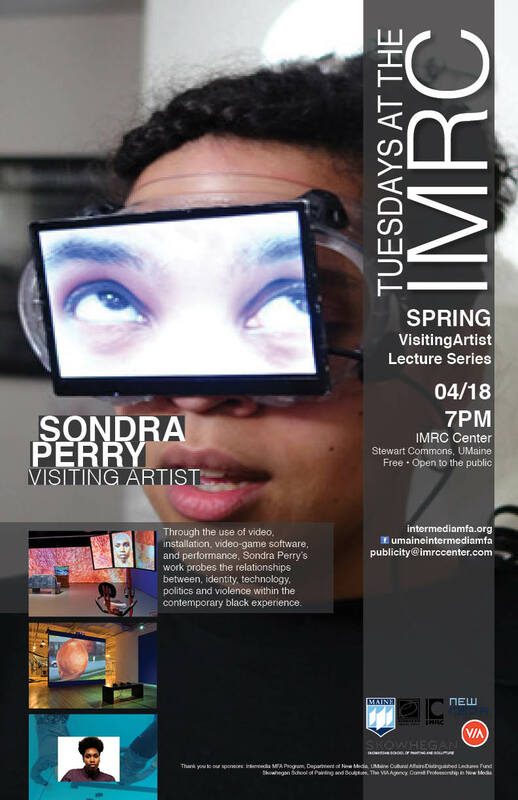 On Tuesday, April 18th at 7p.m., artist Sondra Perry will present her work as a part of Tuesdays at the IMRC, the UMaine Intermedia MFA program’s visiting artist lecture series. Sondra Perry was born in Perth Amboy, New Jersey, in 1986, and holds an MFA from Columbia University and a BFA from Alfred University. In 2015, Perry’s work appeared in the fourth iteration of the Greater New York exhibition at MoMA/PS1. Other exhibitions include Disguise: Masks and Global African Art, Seattle Art Museum, Seattle (2015); A Curious Blindness, Miriam & Ira D. Wallach Art Gallery, New York (2015); Of Present Bodies, Arlington Arts Center, Arlington VA (2014); and Young, Gifted, & Black: Transforming Visual Media, The Camera Club of New York (2012). Perry was a panelist at Black Artists on Social Media at the Brooklyn Museum, NY. In 2014 Perry was Guest Lecturer at the School of Visual Arts, New York, for the course History, Theory, and Practice of the Image, and has participated in residencies at the Skowhegan School of Painting and Sculpture, Vermont Studio Center, Ox-bow, and the Experimental Television Center. Perry is currently based in Houston, Texas as part of the artist-in-residence program CORE at the Museum of Fine Arts, Houston.